Prior to 1834, several Furness parishes operated their own workhouses, including ones at Ulverston, Broughton, Knappershaw, and at Dalton near to the parish church. Barrow-in-Furness parish was part of the Ulvertson union until 19th April 1876. On that day, by order of the Local Government Board, it was separated and constituted a distinct parish for the relief of the poor, to be governed by a Board of twelve elected Guardians and the Justices of the Peace resident in the Parish. Part of the parish of Dalton was also included in the new area. 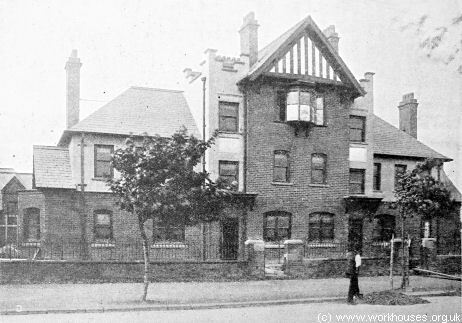 Paupers were temporarily accommodated in a building in Dalkeith Street (later the Hotel Trevelyan, destroyed by bombing in 1941) until a new workhouse was built on the outskirts of the town at Roose. The new building, for 300 inmates, was erected in 1878-9 and was the subject of an extensive report in the Barrow Herald when it opened in February 1880. The foundation stone to the right contains:- "This foundation stone was laid by Mrs H.W. Schneider of Oak Lea in the presence of the Guardians of the Parish of Barrow in Furness on the Twelfth day of September Anno Domini 1878". On the opposite side of this doorway the following is inscribed: "The Guardians of the Parish of Barrow, Mr Henry William Schneider, Chairman; Mr John fell, vice chairman; ex officio members, Sir James Ramsden, Mr JT Smith, and Mr E Wadham; members of the Board:- Messrs. TC Baynes, JP Bell, J Cox, B Fish, J Hunter, R Loxham, T Morgan, W Park, S Swindlehurst, J Thomspon, B Townson and T Williamson; Mr Taylor, clerk and Mr JY McIntosh, architect." Entering the doorway, a capacious hall is reached, which communicates on the right with the master's parlour, on the left to the master's office or committee room, and by means of a noble staircase to the upper storeys of the administrative department. On the basement of the two pavilions are the infirm men's day rooms and infirm women's day rooms respectively, fitted up with closets, lavatories etc. Good cellerage accommodation is also provided in the rear of the building. On the principal floor the pavilions are each divided into halves, on the male side the room to the front being for able-bodied men, and in the rear for boys; in the other wing the able bodied women occupying the front room and the girls in the back room. These rooms are each 30ft by 22 ft. On the same floor in the central block is a vestibule, a staircase, a sitting room for the master to the right and an office to the left. Access is obtained in the rear of this building to a dining hall, and apartment 50 ft by 28 ft. and behind this again, are spacious kitchen. 26 ft by 24 ft, a scullery 24 ft by 16 ft, a provisions room, bread room, and larder. On the first floor are the pavilion to the left, old men's dormitories, and boys' dormitories with a sick room with the same arrangement in the other pavilion for females. Four good bedrooms are provided on this floor in the administrative block. On the top floor, there are on the one side able-bodied men's dormitories and on the other able-bodied women's dormitories with sick rooms adjoining. In each of these wards, there is a small apartment for the use of the master or matron. The rooms are well lighted and airy and are fitted up with suitable stoves to promote satisfactory heating. The manner in which the building has been designed practically makes the two wings into four distinct blocks, each of which has an independant yard to itself, so that when the paupers are in the house or outside they are kept to the several departments they are associated with. There is also a general yard in the rear of the building, and this communicates with the vagrant wards and washhouses, which are built alongside the back wall. A room is here provided for the labour master, together with a waiting room for vagrants, dormitories to hold 30 male and 15 female vagrants, and beyond this is a yard for stone breaking 60 ft by 30 ft with lavatories and everything necessary to carry on satisfactorily the labour test. Surrounding the whole of the yard is a large area of land which will be used for the purpose of growing the necessary vegetables for the use of the house, and also in the furnishing of employment for able bodied paupers. Messrs. Sadler and Andrews were the contractors for the whole of the work, and the ratepayers of Barrow will have the satisfaction of knowing that not only have the contractors done a very satisfactory job, but that they have put up a building which, for the permanency of its character and the superiority of its workmanship will bear very favourable comparison with any building in the district. The contractors entrusted the work of plumbing, glazing and painting to Mr. Rothwell who has done the job in the most creditable manner. Mr JH McIntosh was the architect of the building and he is to be complemented on producing a design embracing so many satisfactory features. 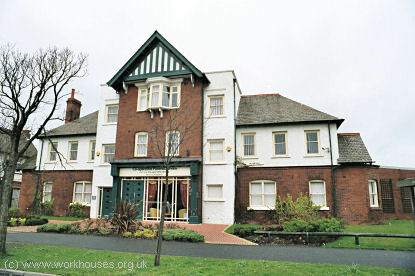 It may be urged that a building like this accommodating 350 paupers and erected at a cost of about £15,000, apart from the value of the land, is too large a scheme for Barrow with only 84 indoor paupers, but in providing this workhouse the promoters have looked well ahead and have put up a house to meet the requirements of the future. Further than this the Guardians of Barrow have for some time past owing to the limited accommodation at the temporary workhouse, been giving out relief to a far greater extent than they now propose to do when they can put the workhouse test in full operation. Another satisfactory feature is the establishment of vagrant wards by means of which all vagrants will have to earn the cost of their lodgings and their food before they are allowed to go on their way. At present 100 to 180 vagrants come to Barrow weekly, and obtain a free ticket for a night's lodgings. It is more than probable that when the tramp class have to work hard for an hour or two they will not be so great a trouble as at present; but on the other hand, real deserving cases will find relief. During the week the work of removing the paupers from the temporary workhouse to the new workhouse has been carried out satisfactorily, and the paupers are very comfortable in their new apartments, but they are almost lost in the immensity of space. The site layout can be seen on the 1911 map below. In 1879-80 a porter's lodge, receiving block and disinfector house were built between the workhouse and the site entrance at the north-east. A separate H-shaped 30-bed infirmary was erected to the east of the workhouse in 1884 at a cost of £2,000. 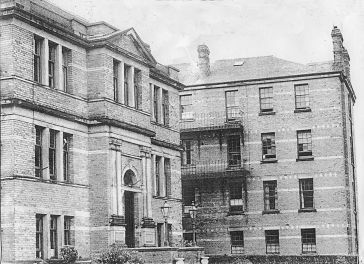 The infirmary was enlarged in 1896 to take its capacity to 80 beds. Barrow entrance block and west pavilion from north-east. 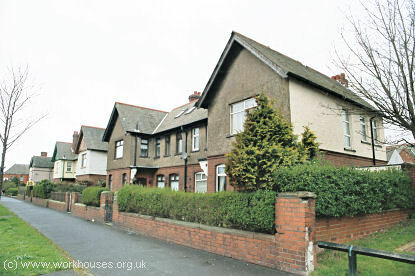 From 1904, to protect them from disadvantage in later life, the birth certificates for those born in the workhouse gave its address just as 1, Rampside Road, Barrow in Furness. Because of its location, the workhouse was known locally as the Big House on the Hill. During the First World War it served as a military hospital. The workhouse later became known as Roose Institution, and then as Roose Hospital. 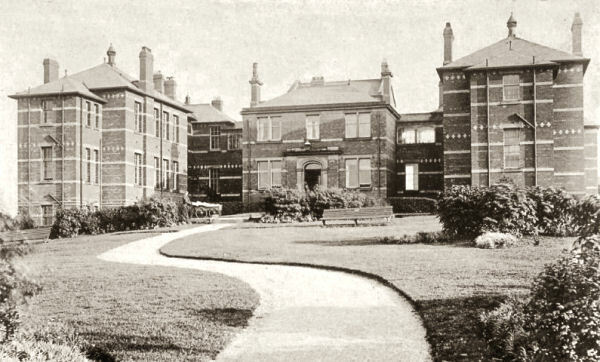 It later began to offer care for the mentally ill and, from 1939, provided a gynaecological service as part of a maternity welfare initiative by the Borough Council. Roose Hospital closed at the end of 1993 and was demolished a few years later. 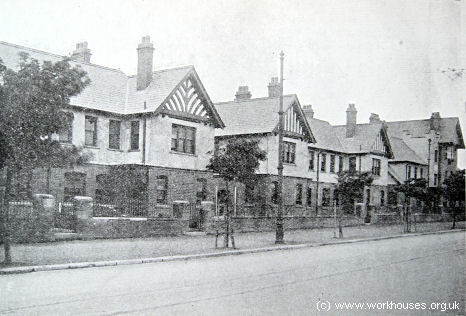 In addition to the main workhouse, the Guardians also built some children's cottage homes on Roose Road in around 1905. These consisted of two pairs of semi-detached houses plus an administrative building accommodating a total of 77 children over the age of three. A foster mother was provided in each house to "minister to their needs with such kindness and attention as they would receive in a good home". Barrow Cottage Homes from the south-west, c.1907. Barrow Cottage Homes from the south-east, 2005. Barrow Cottage Homes admin block from the south, c.1907. Barrow Cottage Homes admin block from the south, 2005. Barrow Archive and Local Studies Centre, 140 Duke Street, Barrow-in-Furness, Cumbria LA14 1XW. Holdings include: Admissions (1876-1949); Deaths register (1876-1942); etc. A History of Dalton-in-Furness by James E Walton (Phillimore, 1984). The help of Elizabeth Ellis in compiling this page is gratefully acknowledged.